White tea is a type of Chinese tea in which harvested tea leaves are only lightly fermented before processing, compared with other types of Chinese tea such as oolong, which is heavily fermented. White tea's comparatively light fermentation accounts for the higher levels of antioxidants that make white tea popular of late. But note, Grasshopper, that "comparatively light fermentation" means light compared to other types of fermented Chinese teas. 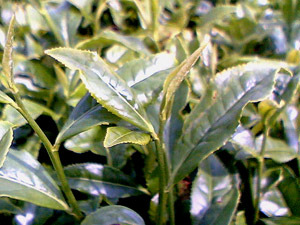 Japanese green tea, in contrast, is not fermented at all before processing, which gives it the highest level of EGCG and other antioxidants of all types of teas. Mellow Monk tea is especially chock full of antioxidants because it's processed immediately after harvest. This stops oxidation and fermentation in their tracks and locks in the flavor along with the antioxidants. This is one of the advantages of a small-scale family farm, where the growers harvest only what they can process right away. Contrast this with big corporate-run farms, where harvested leaves often sit around fermenting in massive piles for hours or even days before processing. In short, Grasshopper, when it comes to EGCG and other antioxidants, small-farm green tea knocks the stuffing out of white tea. And speaking of stuffing, Happy Thanksgiving, everyone. A close-up of a tea plant at a Mellow Monk grower's tea farm in Aso, Japan.